Exterior of the monitor, including the frame around the screen and stand made of black plastic with a matte finish. 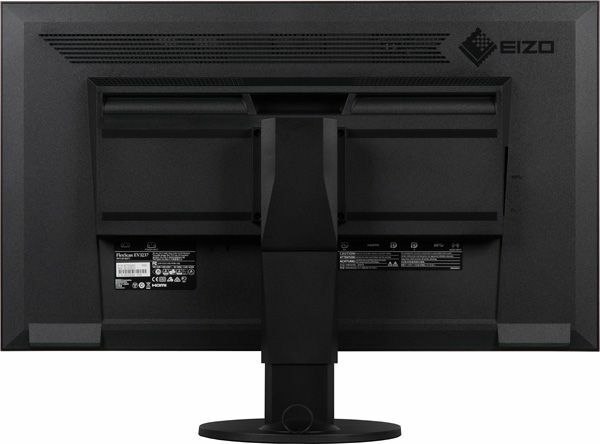 Overall, the design is very rigorous, practical and, thanks to the characteristic of Eizo monitors sloping planes and possibly indirect angles recognizable. Mold surface is black, semi-matte (but well-defined reflectivity) and a relatively solid. At the bottom right of center on the front frame, there are seven buttons. · Video / audio input DisplayPort (version 1.2), 2 pcs. The right of the buttons, you can find the status indicator, and the left – the light sensor window, and the center of the frame – a presence sensor. On the rear panel over the place stand attachment developers made a special niche, forming a convenient carrying handle monitor.Connector and power switch, as well as part of the interface connectors are located on the bottom ledge behind and focus down. On the left side of the same ridge – three output USB connector and headphone output (that’s right – convenient and connect the wires will not interfere with the right, where there is usually a mouse). Also on the rear panel you can find the traditional slot for a Kensington lock. The monitor has a built-in power supply may therefore not without ventilation grilles – the upper and lower ends of the ridge on the back, in the upper part of the back and almost on the bottom of the screen unit at spaced protrusions on the sides. For cuts in these projections can be considered two small oval speaker in their own miniature acoustic boxes. Established stand allows you to block the screen is slightly tilted forward, leaning back on the unusually large angle, lift and turn right and left nearly 360 degrees. Front consists of two parts – an upper part connected to the bottom via a hinge, providing inclination of the screen assembly. The mount the screen assembly is moved up and down in the upper part of the rack, and the bottom has a telescopic mechanism. At both sides of rack used steel rails on which the elements are moved from the plastic with a low coefficient of friction and the weight of the screen unit compensates flat spiral spring. The design of the stand is stiff enough since all load-bearing elements are made of a thick stand of pressed steel. Steel base stand rests on the rotating ring of plastic with a low coefficient of friction. Below on this ring glued rubber pads that protect the table surface from scratches and prevent slipping on smooth surfaces of the monitor. The base of the stand is attached to the rack without tools, no need to even wrap traditional screws with lamb. Stand Base relatively large in size, but it is mostly flat top, which increases the efficiency of the working area of the table. The monitor is not on the stand is stable. The cables from the connectors on the monitor, you can skip through the ring that secures the back of the bottom of the stand in two positions – for passing cables back or sideways. If necessary, you can disconnect the native stand and secure unit on the screen VESA-compatible bracket (area 100 by 100 mm). Monitor packed in a cardboard box with a very concise design. Box relatively wide, but only has a welt handles on the sides, so carry it alone is not very convenient, rescue luggage belts or traditional handle tape. Monitor Made in Japan. The monitor is equipped with four digital video inputs: two DisplayPort in the full-sized version, one DVI-D, and one HDMI. All inputs accept signals up to 3840 to 2160 pixels, but only if it is supported DisplayPort to 60 Hz frame rate, DVI-D and HDMI resolution in this work with a maximum frame rate of 30 Hz. Input selection is done in the list of quick menu. There is an automatic search for the active input, which can be turned off. For DisplayPort and HDMI inputs can be forced to specify the type of encoding of color and brightness range. These inputs are capable of receiving digital audio (PCM stereo only) that appear after the conversion to analog jack 3.5 mm connector. This jack can connect external powered speakers or headphones. Sound in analog form is put through a second 3.5 mm minijack (sound source can be selected in the menu). Built-in speakers sound according to their size and the acoustic environment – quietly, without the bass at all, with noticeable parasitic resonances at certain frequencies, with very large distortion at maximum volume, but with a more or less pronounced stereo effect. Power headphone output was enough to 32-ohm headphones with a sensitivity of 112 dB volume was sufficient, and even with a large margin. The sound quality of the headphones basically good – relatively clean sound, played all the frequencies, in the pauses of noise is not audible. The headphone volume is controlled independently of the settings for the built-in speakers. In monitor embedded USB (3.0) -kontsentrator with one input and three outputs is also 3.0, one of which (upper) can be switched to a higher power to rapidly charge the mobile device (but without any data). By default, the standby data transfer via USB is disabled, but this behavior can be changed in additional menu settings. Entrance to the main menu on and off. Icons-tips are located above the buttons that simplifies the management and navigation. Menu relatively large, readable labels. When adjusting / selecting the settings menu, the main window is removed from the screen, which facilitates assessment of the changes. Menu can be moved into one of the five fixed positions. It is possible to lock the buttons. Russian version of the OSD does not. The CD-ROM that comes with user manuals we found in the form of PDF-files (Russian version available). The quality of the translation into Russian is not very high, so it is best to use the version of the manual in English. Additional software ScreenManager Pro can be downloaded from the company from the page of the monitor, but the work we did not want it – reported that supported by the monitor can not be found. The monitor has a few features that are designed to control power consumption. 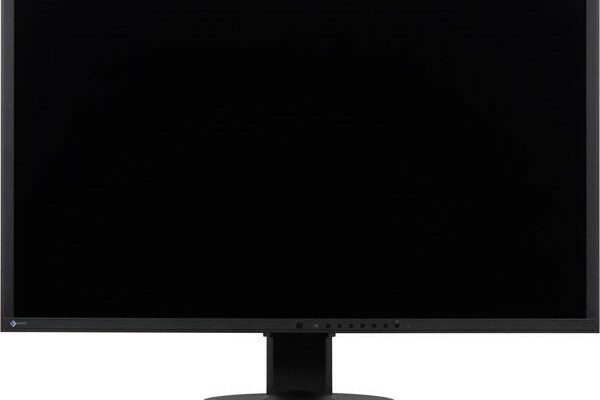 This standby synchronization with the connected PC or after 15 seconds of no sound (can be disabled), adjustable timer to turn off the monitor after a certain time Standby mode with automatic adjustment of brightness depending on the ambient light level, the automatic dimming backlight for dark on average images (can be omitted), and the monitor can monitor the presence of the subject in front of the monitor and go into standby mode after a certain period of absence of the user.Work light sensors and presence adjusted in the menu. Note two things – light sensor facing forward and tracks more lightness clothes user than the lighting in the room and presence sensor reacts to movement rather than presence / absence of obstacles in front of the monitor. There are default settings brightness (backlight) and contrast, as well as not always occur hue and saturation. Color balance is determined by selecting one of the values of the color temperature, as it is possible to correct adjustments intensity three colors. For the gamma curve is offered three profiles with fixed values. Super Resolution function can improve visual perception of low-resolution images when it is scaled to the screen resolution.There are three sets of profiles with predefined settings (including profile and Paper, wherein the reduced intensity of the blue component) and the two user profiles with increased freedom for setting parameters. Combinations of settings appear, are stored for each type of connection. Three modes of geometric transformation: forced stretching the image on the entire screen area (suitable for signals of 16: 9 and anamorphic movies in 4: 3); increase to the borders of the screen while keeping the aspect ratio and the output point to point on the pixels in the center of the screen. If you connect a video source to domestic and have the option to automatically determine the right kind of transformation. There is a dual view picture-in-picture (PinP) and picture-next-to-picture (PbyP). Correction mode can be set for each window individually or the entire screen. Sound source corresponds to the active window (toggle button) or selected from the input image of which is displayed on the screen. In the PinP additional window position is selected in one of the four corners, as well as its size corresponding to a width of 1024 or 1280. If the resolution of the signal for an additional window corresponds to one of these values, it is the same dimensions on the screen output will be carried out pixel by pixel. In the PbyP when dividing the screen into two parts, you can get two images with a resolution of 1920 by 2160 or 3840 by 1080, three – two in 1920 to 1080 and one in 1920 to 2160, four – four and a resolution of 1920 by 1080, and each in coincidence the native resolution of the monitor and the input signal is output pixel by pixel. That is, on this monitor can receive up to four full-fledged desktops / images from four sources. By default, the monitor causes the source to change the resolution of the windows so that the output is pixel by pixel, but this behavior can be disabled in the additional settings menu. Connecting with an HDMI or DVI because of the limitation of 30 frames / second at full resolution only interesting as a source for the sub window (lower resolution) or video source. Therefore, all the basic tests were performed when connected to DisplayPort mode 3840 to 2160 pixels at 60 Hz frame rate. Theatrical modes were tested when connected to a Blu-ray-player Sony BDP-S300 . Checks operation via HDMI. Monitor only accepts progressive signals, namely, 576p, 480p, 720p and 1080p at 50 and 60 frames / sec. 1080p at 24 frames / sec is not supported. Subtle gradations of shades differ both in light and shadow. The brightness and color definition high. Interpolation lower resolutions to the resolution of the matrix is carried out without any significant artifacts. “Crystalline” effect is so weak that it is possible to recognize its absence, there is only a slight variation of the brightness and color tone in the scale of neighboring pixels. The matte surface of the matrix allows to work with comfort in the case of an exemplary embodiment of the monitor layout, user and fixtures in the room. Grain of these defects is several times smaller than the subpixels (scale above two pictures the same), so focusing on microdefects and “jump” focus on the subpixels by changing the angle of view is weaker because of this there is no “crystal” effect. To assess the quality of color used i1Pro 2 spectrophotometer and set of programs Argyll CMS (1.5.0) . This spectrum is relatively narrow peak with blue and broad hump of green and red color characteristic of monitors that use LED lights with blue emitter and yellow phosphor. Close to black band can be ignored, as it color reproduction is not as important as the measurement error of the color characteristics is high. Manual correction resulted in a nearly perfect record. However, even demanding users may well limit the choice of a preset profilesRGB. The measurements were carried out in the brightness of the screen 25 points located in increments of 1/6 of the width and height of the screen (screen borders are not included). Contrast was calculated as the ratio of the brightness of the fields in the measured points. It is seen that the brightness increases smoothly and linearly and literally in a split second. Do the practical benefits of this feature – it’s user. The main thing is that it can not be included. In standby mode, and conditionally off the monitor consumes about 0.4 watts. 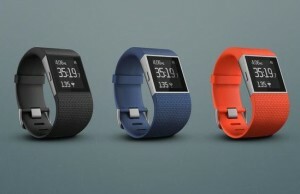 However, if the active presence sensor, the consumption in the standby mode increases to 9.8 watts. Mechanical switch on the rear panel is completely unplug the monitor. 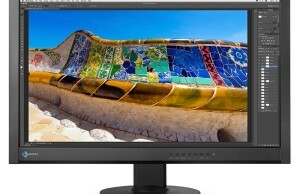 Monitor’s brightness changes is the backlight brightness, t. E., Without compromising image quality (contrast is maintained and the number of distinguishable shades) monitor’s brightness can be changed in a huge range that allows you to work comfortably and watch movies in both lit and in a very dark room . Residual modulation is only on the lowest brightness, and then only with a very high frequency of 18 kHz. Optimal from our point of view is the mean value, since the maximum acceleration is already very noticeable artifacts. In general, this rate matrix is sufficient, even for games in the dynamic of the game. We determined the complete output delay from switching pages framebuffer before the display on the screen. In this case, the resulting value does not include the unknown fixed delay value from the request for page flipping video buffer before starting ADC with an external photocell mounted in the center of the monitor screen, as well as some constant / variable delay caused by the fact that Windows is not a real-time system with normalized delays and features of the graphics card, its drivers and Microsoft DirectX. That is, the resulting latency is tied to specific hardware and software configurations. As a result, the image output delay of almost 60 ms at 30 Hz frame rate and 40 ms at 60 Hz (regardless of the resolution). The second value corresponds to a delay longer (full! ), Which is not felt at work, and in dynamic games it can hardly be noticed. To find out how to change the screen brightness at a deviation from the perpendicular to the screen, we conducted a series of measurements of the brightness of black, white and shades of gray in the center of the screen in a wide range of angles, rejecting the sensor axis in vertical, horizontal and diagonal (from corner to corner) directions. Note smooth dimming with a deviation from the perpendicular to the screen in a horizontal direction, and the graphics do not cross over the entire range of measured angles. A little faster falls brightness deviation in the vertical direction. In the event of a diagonal direction brightness shades behavior is intermediate between the vertical and horizontal directions, except for the brightness of the black field, which already begins to increase sharply at 20-30 ° deviation from the perpendicular to the screen. If you sit from the screen at a distance of 50-60 cm, the black box at the corners will be noticeably lighter than in the center, however, remaining roughly neutral gray in hue. Contrast in the range of angles of ± 82 ° around approaching 10: 1 only in diagonal deviation and the deviation at one corner (of the two tested) falls below the level after 72 °. As a reference point can be chosen deviation of 45 °, which may be relevant in the case of, for example, if the image on the screen simultaneously treat two people. The criterion is the correct colors can be considered the value of ΔE less than 3. Color stability as a whole is very good, although the light blue and dark blue lightly knocked out. Perhaps only because of the lack of support coverage AdobeRGB and 10-bit mode LCD Monitor Eizo FlexScan EV3237 can not be attributed to the professional models, designed for precision work with color. However, the image quality and equipment of additional features this monitor is superior to some monitors, claiming to be professional. Especially we noted a high color accuracy when selecting a preset profile sRGB, and excellent uniformity of black and white.